This variety is the originally called „Holsteiner Cox“ from the former historical region „Holstein“ in the northern of Germany. Meanwhile quite common on sale in super markets here. 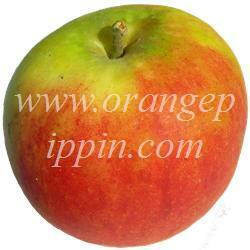 Some traders use this one as substitute for the famous Cox Orange Pippin. But they are more different than equal regarding the taste from my point of view even if the same family. Holstein is characterized by a richly spiced enjoyable acid if fully ripe which tends to be like its apple grand father Ribston Pippin as often assumed. The taste experience is amongst others very dependent on the storage conditions and the „right moment“. I would recommend to keep the bought ones cool and let the basic color change from green to a slight yellow. Eat them well cooled (around 50 °F / 10 °C) to get a fresh, juicy and dense flesh. You can also use this apple for pies, cakes or remove the core and directly bake it in an oven with a nut-butter-cream or almond paste filling (Don't forget the vanilla sauce for Christmas season). The skin remains comparatively fine while cooking. All in all this is definitely one of the most underestimated apples. Flavor in New England not as rich or complex to my taste buds as its reputation. Taste before you plant, or you may be disappointed by it. I grow 54 varieties of apples and Holstein is my flavor favorite. Beats the hell out of Honeycrisp. I only wish I could coax more production out of my trees. I have it on two different rootstocks, and both are stingy producers. Plus, if you just look at these apples they fall from the tree. If it didn't taste so good I would prune both trees---at ground level! When I have a few to take to market, they fly off the table. People will most often just buy everything I have in one purchase! If anyone knows how to get more production from these trees, please let me know! I'm still waiting to taste one, which will likely be from my own tree. I purchased the tree mailorder in 2011, along with several other hard to find varieties, from Maple Valley Orchards, in Wisconsin, USA. Just eaten a lovely, organic, German one of these. I will definetly be a repeat buyer. Comment for Antje. You will not see Holstein apples for sale on the lower mainland. I've not seen them in any nursery either. You can graft your own tree or buy one from someone who grafts trees. The graft material for Holstein is available. It comes from local home gardens. 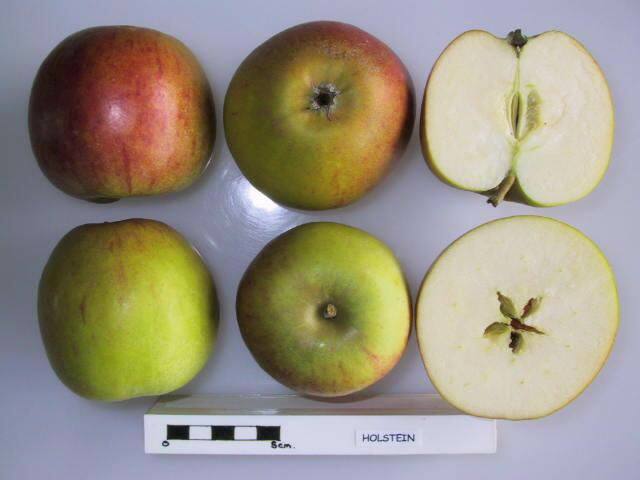 It is a very good 'cox' style apple for the wet weather of the westcoast of BC. Scab resistant. This apple is grown by many in the Home Orchard Society. It is one of my favorites in my own orchard. I like it as a fresh eater and as a pie. Is this the "Holsteiner Cox"? Holstein Cox is very common in Northern Germany. It was grown from Cox Orange in the region of Holstein. It is my favourite dessert apple, but unfortunately I have never seen it in Canada even though the West Coast climate is quite similar to Northern Germany.